Costa Rica international Keylor Navas was excluded from the Champions League squad again, leaving his future at Real Madrid in the air. During the time when Julen Lopetegui was the Real Madrid manager, the only situation that he handled relatively well was the goalkeeper debate inside the squad. President Florentino Perez wanted to impose his law on the manager and he never gave in when it came to Keylor Navas, Thibaut Courtois’ arrival from Chelsea didn’t matter to him and he gave minutes to the two incredible goalkeepers he had at his disposal. During his time as the boss, Julen never gave any indication or clue of who would be the goalie for any match the squad played during the start of the season. Now that Lopetegui has left the club, all of that has changed and Courtois has become the selected goalkeeper for new manager Santiago Solari and leaving Keylor Navas with no options to actually fight for a starring role in the club where he won three consecutive Champions League trophies. We’ve already mentioned how the Costa Rica skipper has been constantly mistreated by the club’s president, the former manager at least gave him a little bit of respect but Solari has completely forgotten him and this should push Navas to make a decision that he had been avoiding for some time. #ChampionsLeague Se le hizo a Tito Floren 🤬🤬🤬🤬🤬🤬. Right after Solari arrived in the club as the interim manager, the Argentine coach made his decision and placed Keylor Navas as the starting goalkeeper for the Copa del Rey match against Melilla as his very first test match that would determine if he was going to stay in the club or not. The problem with this was that traditionally, the goalkeeper who plays the cup competition is usually the one who misses out on all the Liga and Champions League action. 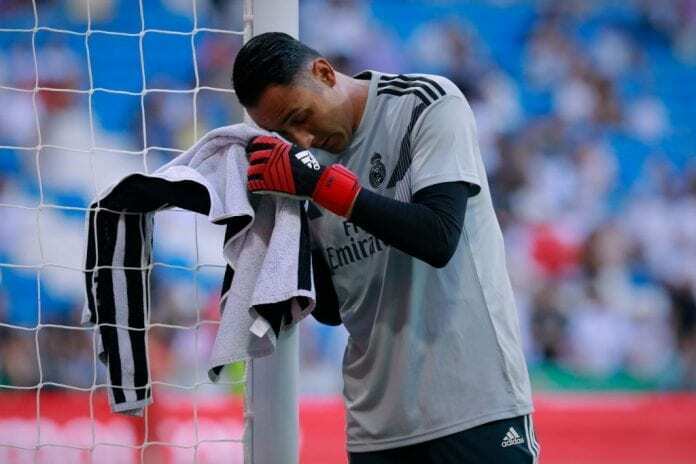 Keylor feared that this was going to be the case with Solari, but he still kept a small hope that he would be the selected goalkeeper for the upcoming La Liga match against Real Valladolid at the Santiago Bernabeu last weekend. The Argentine manager finally decided on the Belgian goalkeeper instead of Keylor, something that left the Costar Rica legend on a very tight spot because he witnessed the beginning of the end for his Real Madrid career as the starting goalie. The final nail on his coffin would come a few days later, during the Champions League trip to the Czech Republic against Viktoria Plzen. Just like it was expected, Solari decided to use Courtois for the most important competitions and he left Keylor Navas alongside all his history with the club on the side. This leaves Navas with a very difficult decision to make, this new setback in his career could possibly push him to leave Real Madrid during the winter and start from scratch in any major club that decides to sign him. There hasn’t been any confirmation on what the goalkeeper will decide in the end, but the future doesn’t look very promising for him if Solari ends up keeping the job as the manager. Navas posted an image on his Instagram account from a Bible passage that said: “Blessed is the man who trusts me, who places all his hopes on me,” he wrote. “It will be like a planted tree next to a river, that extends its roots to the current and doesn’t fear when the heat reaches it, for its foliage is always leafy. During the time of drought it never falters, and it never stops flourishing,” he concluded. What do you think Keylor Navas should do after clearly being left out as the Real Madrid first goalkeeper? Please share your opinion in the comment section down below.